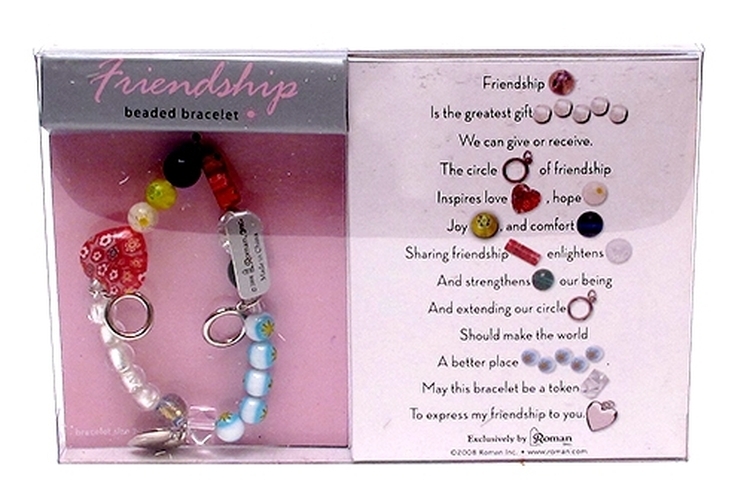 Friendship Beaded Bracelet - Adult size. This bracelet celebrates the importance of friendship in our lives. The beads and charms of the bracelet symbolize the ways in which friendship enriches life. Blessing card included reads "Friendship is the greatest gift we can give or receive. The circle of friendship inspires love, hope, joy, and comfort. Sharing friendship enlightens and strengthens our being and extending our circle should make the world a better place. May this bracelet be a token to express my friendship to you." Adult size. Fits 7-7.5" wrist. Measures 1"W x 0.5"D x 4"dia. Glass/metal/wood. Gift Box. Roman Exclusive. These are made from real glass crystals, metal, and wood. Product may have to be restrung. This is a close out item and will not be restocked.